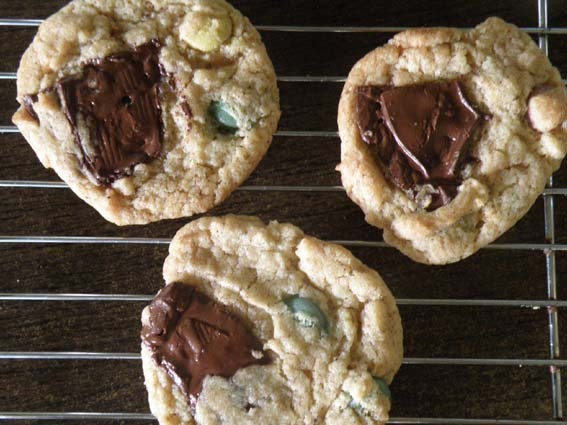 Since discovering it a couple of years ago I have always used the Neiman Marcus Cookie Recipe because as far as I am concerned I have yet to taste better. I finally decided to try it again now that we are egg free and replaced the 1 egg with 1 tbsp flax and 3 tbsp warm water (mix together then let sit until “gloopy” like an egg before adding to recipe). I think Flax is by far the best replacement when it comes to cookies. You really could not tell that these were missing anything at all. I find that the Kinnerton Luxury Dark Chocolate is the only chocolate my son can have and is really lovely. I just wish they sold it here in Belgium so I didn’t have to rely on bringing it back from the UK or people sending/bringing it to me! 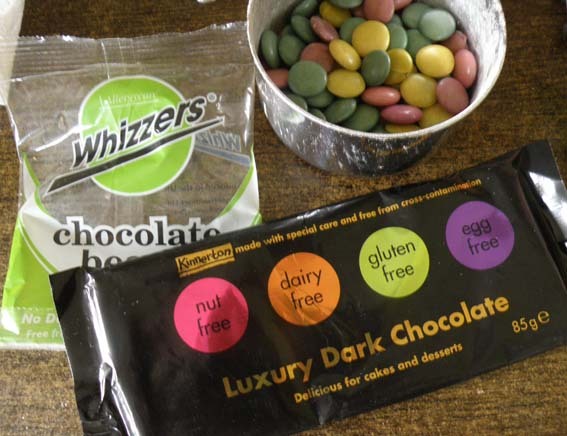 The Whizzers Chocolate Beans are fantastic, made with natural colours and really held a lovely crunch even after baking. Superior to a more well-known brand I would say…. visit Lisa’s fab blog for lots more yummy dessert ideas from other fab bloggers! I’m thrilled that you linked up more than one. I always say, the more the merrier. Thanks so much. Hi, I have just found your blog voa redTed Art and see that you use the Kinnerton chocolate, my friends little boy has dairy, egg & soya allergies too but I see the chocolate has soya lecithin in, is your son ok with that? I’m pretty sure hers can’t & she has trouble finding chocolate without it..
It’s a good question. When I discussed this same thing with my allergist and then the dietician they said that it is one form of soya that almost all soya allergics can have. However there are rare exceptions so I would of course say your friend should discuss with a professional. Luckily Levi can have it and loves it. When using flax as a replacement egg , is the flax seed , ground flax or oil?